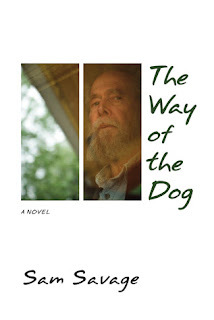 Again, Sam Savage has created a character that lives and breathes and has thrust the reader inside of his head to experience his unpleasant life. This time it's Harold Nivenson, once a minor painter and art collector, now elderly and falling further into decline after losing his dog Roy. Nivenson writes obsessively on index cards or scraps of paper which he used to file away in an orderly fashion but now just stacks into piles until later throwing them away. He spies on his neighbors from the window and reminisces about his past life as his condition, and that of his house, continue to deteriorate. In his youth, Harold Nivenson was friends with an artist named Peter Meininger. Nivenson tried to emulate him as much as possible before eventually growing to hate him. Meininger is now dead but their rivalry is kept alive in part by the large collection of his paintings staring down from the walls of the house. The house itself has become oppressive; bought hopefully using inherited money, it once sat in a bohemian neighborhood and was filled with artists and their ilk. But Nivenson never completed his remodeling plans, the neighborhood has changed, and he remains alone and trapped. In fact, Nivenson is not completely alone. His son arrives, a distant figure who Nivenson calls Alfie despite the fact that his name is actually Sidney. A woman named Moll moves in to take care of Nivenson, though she is an older lady herself. Their relationship is only revealed late in the book. Nivenson is resentful towards both Moll and Alfie, interlopers invading his privacy, and bringing along strangers who traipse through the house invading his solitude. Like Edna in Glass and Andrew in The Cry of the Sloth, Harold Nivenson is an unappealing person but he is by far the most relatable. Despite his repeated claims of insanity, Nivenson is actually the most sane of Savage's characters. He is someone we may all become someday; elderly and declining, barely able to get around and not doing a great job of taking care of himself. He talks of suicide, though carrying it out seems unlikely. His isolation is only increased by the gentrification of his neighborhood, which is slowly transforming into a place he doesn't recognize. I think it's because this story could so easily be one's own life that it's not as funny as the other two books I mentioned. But true to his style, Savage employs wonderful little nuggets that I marked throughout the book, clever turns of phrase, and occasional bits of lucid wisdom. In considering the different ways in which a single event could be described Nivenson observes, "There is no necessary connection between the events of a life and the lies that recount them." "Weekday mornings the neighborhood is at its most bizarre and alienating, as if someone has kicked an anthill. They pour from the nest, rushing and tumbling into the street, mandibles masticating the last crumbs of breakfast, antennae waving." I think it is the realism of this book that makes it my least favorite by Savage, which is completely unfair. It's just as well-written, the protagonist just as real, but it's unpleasant to be forced to confront old age and poor health. And Nivenson is so unhappy about a lot of choices in his life, feels like a failure in many ways, and has isolated himself from everyone around him. It's so easy to imagine becoming him. Which, of course, is exactly the beauty of the novel.